WITS writers often turn to Paul Fleischman when they teach choral poetry. 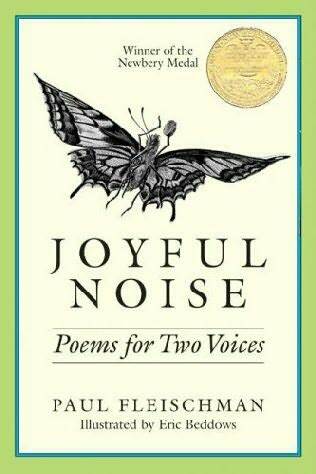 His book Joyful Noise: Poems for Two Voices has delightful, double-column poems about insects. The poems, which include everything from a love affair between lice to fireflies writing in the sky, are written for two readers alternating turns. What I did not realize until recently is that Paul’s father Sid Fleischman was also an accomplished writer, who like his son, is a recipient of a Newbery Award. In addition to writing screenplays, Sid is the author of notable children’s books such as The Whipping Boy. Go to your local library this week and check out some books by Paul and Sid Fleischman! Then, write a poem for two voices. Record your poem with a friend or parent!